Hi all... Firstly, thanks for the site... Lots of pics and some good info. We are coming to Scotland in March/April 2019... We would like to see a bit of snow and are not too worried about cold weather as we are coming from Queensland Australia...So we are always hot over here... So is this a good time for that??? Then we will head to Skye for a couple of days, and start our travels from there.... We would like to do some walks, but need easy type ones as i do have a relatively serious back injury and probably couldn't scale a mountain anymore... But also, would we be better hiring a car, or is the train and bus network a better idea??? Who knows i may want to stay there... I have only been back once in 1975, and we emigrated in 1969ish.. I'll write some quick thoughts to start based on my opinions, feel free to follow up with specifics. Snow in Mar/Apr is a hit and miss but the probability is higher early Mar vs late Apr of course. The current cold spell is not normal, it's pretty ridiculous. Spots like Glencoe, Cairngorms and other ski centres give you the best chance of snow. Absolutely rent a car and do not miss going to the Outer Hebrides. Make sure you book accomodation and ferries 3-4 months before your trip. You will love the pristine beaches on Harris + Uists and the magic of Lewis. Fire away on followup questions. Will give my easy and rewarding walk recs tomorrow. The beaches do look awesome, however as we live on the Gold Coast, they wont be high on our list... However, saying that we would like to have a look at the Hebrides. The snow isn't as in having a ski, more like seeing a dusting falling, we will appreciate the weather which ever way it is. Hello again @lushnpops, I am dying to visit Australia in general and the Gold Coast in particular, what a beautiful part of the world. The Hebrides was my suggestion for you also because it is quite flat (and so is Orkney) which lends well into gentle yet scenic walks. Similarly, the locales of the few ski spots Scotland has generally have a higher chance of snowfall than other parts of the country. Having a ski is generally rare actually compared to say the Alps. Yeah Australia is a big place... Autumn on the Gold Coast is the perfect time to visit. The waters are generally very calm, and the temperature is 26c just about everyday...And it hardly never rains in Autumn. Also within a 2 hour drive you can go from beach to beach, see tropical rain forests and mountains, also see rural areas of farmland. Drive 5 hours and you can hit an almost luna type arid desert scene. 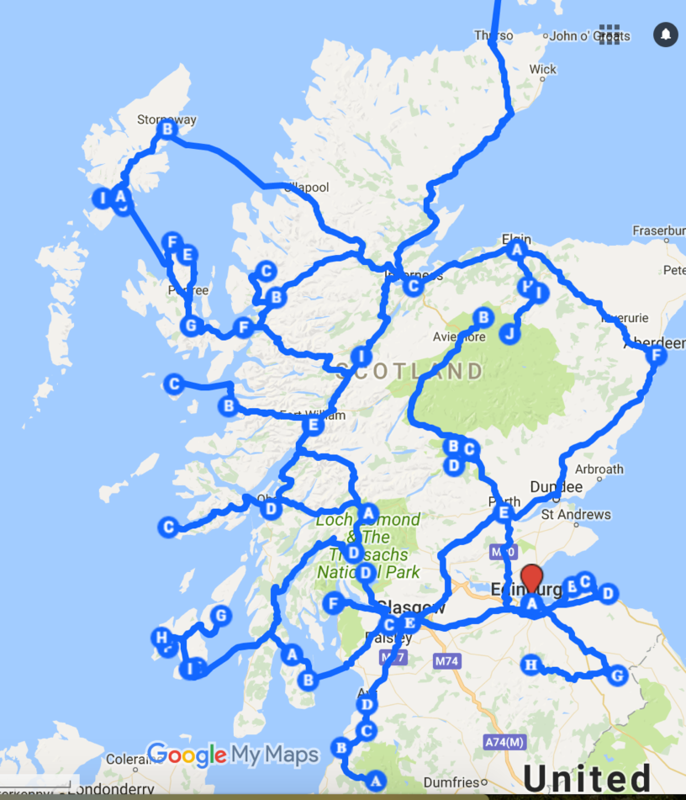 My personal longest (solo) trip was 4 weeks long and it was not comprehensive by any means so I could have extended it to 6 weeks if I knew how to drive (to see the North Coast and the Outer Hebrides) and I had my lovely significant other for company (I began to unbearably miss her by the end of 4 weeks). The biggest advantage of doing my long trip while camping and backpacking was that I had no fixed itinerary and was chasing the weather to cover the places I wanted to see. Hence, my personal recommendation would be to have a motorhome to avoid the logistical nightmare of booking B&Bs and hotels for 4+ weeks and changing plans as the weather reports change. Attaching a map of most of the routes I covered on my 4 week trip for reference, happy to share information / anecdotes that I found helpful on my long-term travel trip. Hope it gives you some insights. I have a lot of info not documented in that post as I broke the word limit so feel free to follow up with any questions on long-term travel in that thread.